Health care is never far away when you live in Sun City or Sun City West. One of the most important factors when choosing a 55+ community is nearby health care. Being a few minutes away from your doctor and any specialists can save a lot of time and make a stressful situation less so. While moving into a community near highly rated medical centers and hospitals is always a good idea, some active adults enjoy health care right inside their community. No 55+ community exemplifies this more than the original Sun City and Sun City West in Arizona. Built between 1960 and 1978, Sun City became the gold standard of active adult living and has remained that way for decades. Around the time Sun City hit build out, nearby Sun City West began construction, which was completed in 1997. But even though these communities are at completion, that doesn’t mean they’re never changing. Both are home to on-site retail, entertainment, and worship centers, and like anywhere else, close when demand isn’t there. One recent trend in the communities is for doctor offices and clinics to take up the empty storefront. This has given residents more options and smaller wait times when seeking medical help. Besides these smaller offices and clinics, the Sun City communities are home to two long-standing hospitals. We’re exploring them and how they benefit Sun City and Sun City West homeowners. Banner Boswell Medical Center has serviced the community since 1970 and provides rehabilitation services, women’s health, geriatrics, and many more services. The hospital’s health center is nationally recognized in preventive care, diagnostic services, and surgery. It also has a comprehensive cancer program. Also on site are an eye center, arthritis and rheumatology office, and a pharmacy. Besides being recognized by the American College of Surgeons Commission on Cancer for having a comprehensive cancer program, the hospital was named as one of the Top 100 in the nation by Truven Health Analytics. The hospital is located at 10401 W Thunderbird Blvd, directly north of the Sun City Golf Course and south of Lakeview Recreation Center. Many homeowners even live within walking the distance of the hospital. Like Sun City West, Banner Del E. Webb Medical Center is slightly newer than its Sun City counterpart. 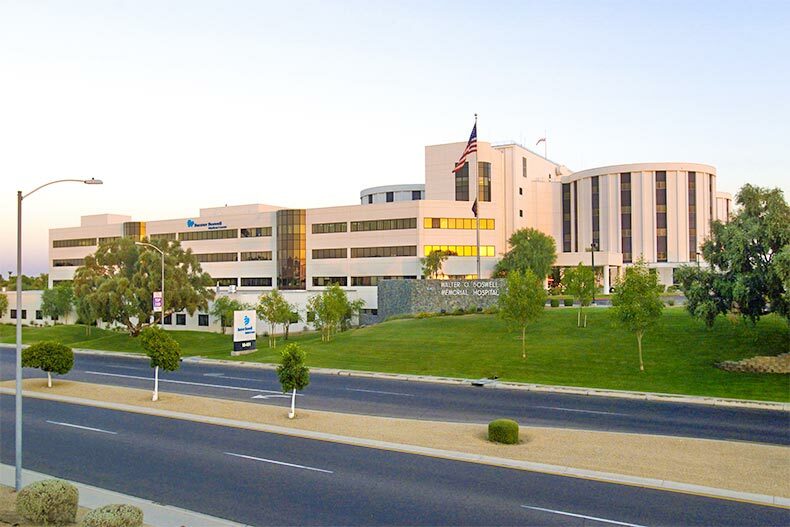 Opened in 1988, it is the eighth largest hospital in the West Valley. Banner Del E. Webb Medical Center specializes in cardiac services, women’s health, orthopedics, and robotic surgery. Other services include neuroscience, mental health, and volunteering opportunities. The hospital is also known for its Partners in Caring program which allows patients and their family to set a plan with doctors to figure out the most comfortable stay possible. Located at 14502 W Meeker Blvd, the hospital is across the street from the Village at Sun City Grand Condominiums and next to the Grandview Golf Course. With a location in the heart of the community, every resident only has to make a short drive or walk to get medical care. Also located on hospital grounds are a hearing center, cardiac services, and allergy clinic. As mentioned, both hospital campuses include general practitioners and specialists, so Sun City and Sun City West homeowners almost never have to leave the community for their health care needs. Residents can also find several other medical offices and clinics throughout the communities, too. That includes general practitioners, dentists, dialysis centers, and other specialists. Just outside community borders in Surprise and Peoria, they’ll find even more medical centers. Of course, this doesn’t include all the options that allow residents to stay active and fit throughout both communities. Whether it’s a fitness center, lap pool, tennis courts, softball, pickleball, or just scenic walking and biking trails, Sun City and Sun City West make it easy for active adults to stay happy and healthy.